At the beginning it was to do something like on the site php.net See this page for example. The purpose was to have some sort of official content (possibly technical), and have users contribute notes, hints, in comments. I recently had a request to make the comment be threadable (like in slashdot or LinuxFR so that is is possible to use Wiclear as a forum. So in the future you will have the choice of having the comment in BB style (flat as they are now) or threadable. Use the "Comment" link available below each content. This will display the comment form. This form is differnent depending if you're an anonymous user or if you have logged it. The form in the screenshot is the form for anonymous users. For logged users, "pseudo" and "email" are not shown, this information is taken from your preferences. For anonymous users, "email" is not mandatory. Don't be upset, your email will be "encoded" so that bots will not be able to read it that easily. 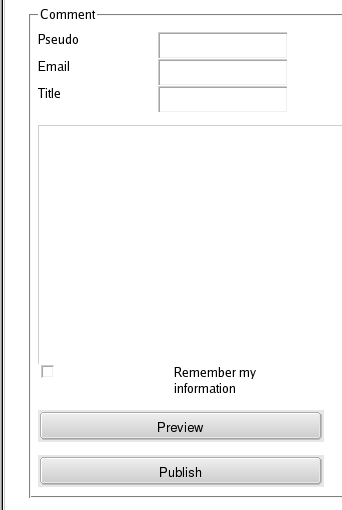 The "Remember my information" checkbox can be used to prefill the form with pseudo/email details the next time you post a comment. This form works on the same model as the edit form : enter a title, some content and preview it. When you're happy with your comment, you can publish it. WARNING : a comment is not modifiable once it has been published : preview it before publishing it. The "delete" link is available only to moderators.